The pain and any surface marks from the burn went away pretty quickly, and I’ve set my sights on finishing the crocheted herringbone skirt. I’m farther along now, with just a few inches to go on one of the pieces. The other piece is about halfway done as well. 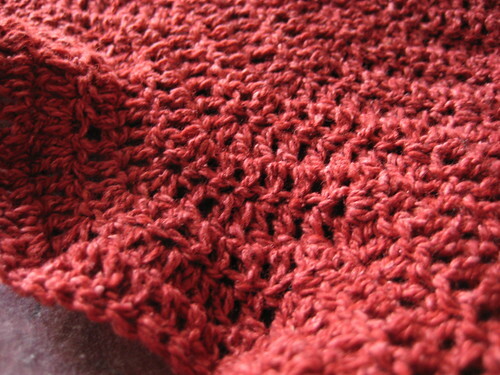 The pattern, just as a reminder, is from the Fall 2007 issue of Knitscene. 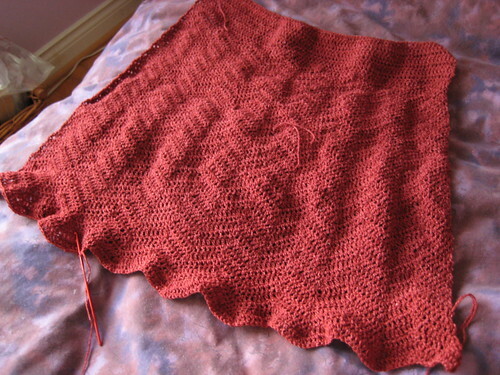 I had four skeins of the yarn (silky wool) in my stash to start with – the pattern calls for eight. I crocheted two balls each of the front and back while waiting for more yarn to come. I knew it’d be a different dyelot, of course. It does show (the new yarn is brighter) but luckily, it’s at a point where it looks perhaps intentional – pretty much right where the increasing for the flare begins. So I’m okay with it. I ordered five extra skeins (so nine total), and I think I’ll only need seven. Maybe I’ll make it a little longer, since I’m not planning on doing the mini ruffle at the bottom. I grew that! 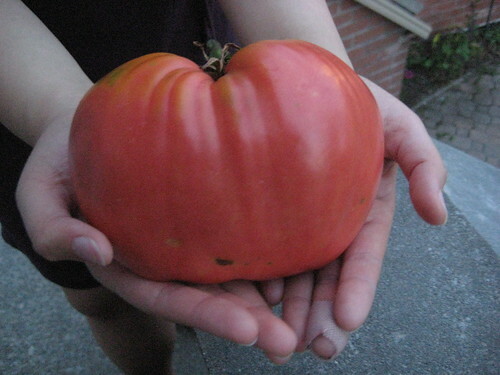 A HUGE tomato, heartland variety. Those aren’t kid-hands, either! It’s not quiiiiite ripe, but I picked it anyway under the strong urging of a garden-neighbour, because it is almost ripe, was at the front of the garden (easily accessible), and because it is big – don’t want to risk someone coming along and yoinking it! I’ll give it a day or two in the kitchen to ripen up before the ritual devouring. wow that is an awesome tomato! A meal on it’s own. beautiful red crochet skirt and I like that crochet stitch pattern, it looks like the skirt is dancing. That tomato is pretty impressive! Oh wow! Now THAT’S a tomato! LOL! So sorry about the finger though! Now, the skirt is looking really great. 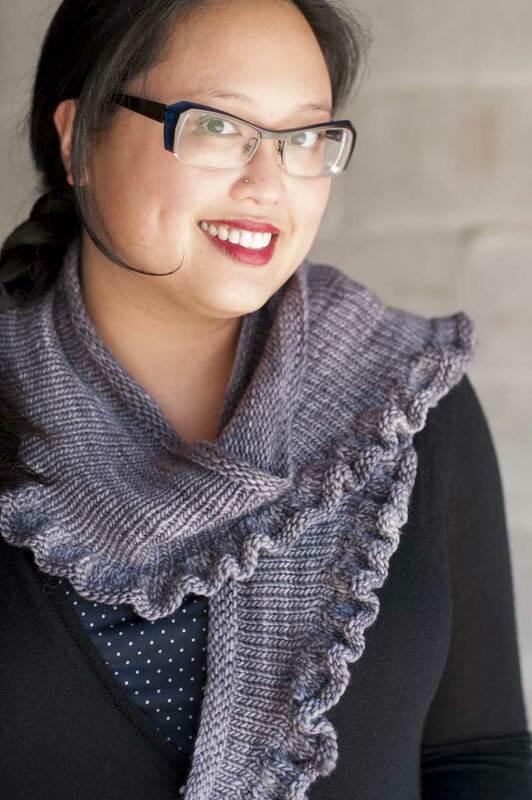 I’ve only ever crocheted doilies… your skirt is making me think about picking back up my hook! That is a huge tomato! Smart of you to pick it now, before the birds notice it and you end up with a rotten mess. I hope it tastes as good as it looks. Holy Crap that’s a big tomato. And I now want that skirt. Damn. Don’t forget to send me an email with details you want photographed! …and back to your post, that tomato is huge! Hope it ends up tasting as good as it looks! One acronym for the tomato. That is one HUGE tomato! I picked my first tomato and it is easily fits into the palm of my hand. You could call this your tomato skirt : ) similar color! I love this one!!! You could try to make some very good gazpacho (Spanish recipe)… a cold soup with a incredible color. Holy Tomato! That is so neat.